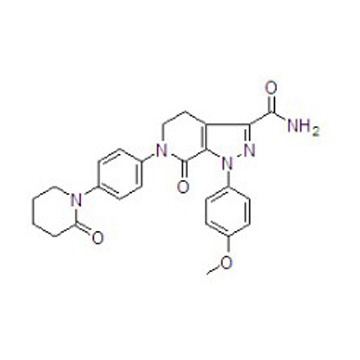 Apixaban (BMS-562247-01, tradename Eliquis) is an anticoagulant for the treatment of venous thromboembolic events. It is a direct factor Xa inhibitor. Apixaban has been available in Europe since May 2012. An FDA decision on apixaban which was expected on June 28, 2012 was initially delayed before final approval on December 28, 2012. On August 21, 2014, Pfizer announced that apixaban was now FDA approved for treatment and secondary prophylaxis of deep vein thrombosis (DVT) and pulmonary embolism (PE). It is being developed in a joint venture by Pfizer and Bristol-Myers Squibb.